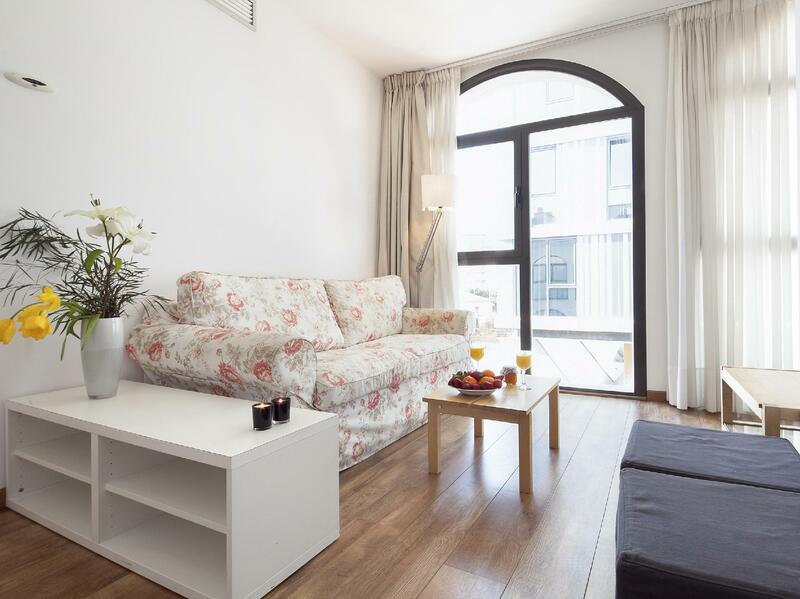 ﻿ Inside Barcelona Apartments Sants Barcelona. JIMAT di Agoda.com! Ada soalan mengenai Inside Barcelona Apartments Sants? Terletak pada kedudukan yang baik di kawasan siar-siar, budaya, beli-belah di bandar Barcelona, Inside Barcelona Apartments Sants menyediakan tempat yang paling sesuai untuk anda berehat seketika dari kesibukan hari anda. Dari sini, tetamu boleh menikmati akses mudah kepada semua yang bandar meriah ini boleh tawarkan. Syurga untuk berehat dan bersantai, hotel ini akan menawarkan pembaharuan penuh hanya beberapa langkah dari pelbagai daya tarikan bandar seperti Esencia Natural, Konsulat Jeneral Kerajaan Maghribi, Mercat de Sants. Di Inside Barcelona Apartments Sants, segala usaha dilakukan untuk membuatkan tetamu berasa selesa. Oleh yang demikian, hotel ini menyediakan perkhidmatan dan kemudahan yang terbaik. Untuk menamakan beberapa kemudahan di hotel ini, terdapat Wi-Fi percuma semua bilik, Wi-Fi di tempat awam, tempat letak kereta, penjagaan kanak-kanak, bilik keluarga. Hotel-hotel telah direka demi keselesaan dan memudahkan tetamu. Sebahagian bilik menyediakan televisyen skrin rata, internet wayarles (percuma), penyaman udara, pemanas, meja. Di samping itu, pihak hotel menawarkan aktiviti rekreasi untuk memastikan anda mempunyai perkara untuk dilakukan sepanjang penginapan anda. Apa juga tujuan lawatan, Inside Barcelona Apartments Sants merupakan pilihan yang terbaik bagi penginapan anda di Barcelona. Penginapan ini tidak mempunyai kaunter pendaftaran. Tetamu perlu memaklumkan pihak penginapan 3 hari lebih awal jangkaan waktu ketibaan mereka. Khidmat pengemasan ditawarkan untuk tetamu yang menempah 7 malam berturut-turut. Tetamu yang tiba selepas 9:00 PM tertakluk kepada surcaj EUR 25 dan ketibaan selepas 0:00 AM akan dikenakan surcaj EUR 40. Nombor lesen penginapan ialah HUTB-001653, HUTB-001657, HUTB-001651. Cukai bandar sebanyak EUR 2.25 campur VAT seorang semalam akan dikenakan dan dikutip di penginapan untuk tetamu yang menginap di Barcelona. Cukai bandar sebanyak EUR 0.45 campur VAT seorang semalam akan dikenakan dan dikutip di penginapan untuk tetamu yang menginap di kawasan lain di Catalonia. Very near the train station and Metro. Café and restaurants nearby. TV is too small, shower heads are not in good condition, bedside table is obstructing the wardrobe. Otherwise, very good. Everything is fine. But housekeeping is not included. Toiletries given is too little for 3nights stay. The road can be very quiet at night. Absolutely brilliant place. Very comfortable home from home, right near the train station & plenty of shops & restaurants nearby. We walked to the Camp Nou from here, only a mile & was a lovely walk too. You won’t regret booking this. A little expensive but can't complain about anything else. Only a 3 minute walk from the metro & although the apartment was not obvious, our welcome was on time & informative. Extra support is only a phonecall away. Spotless & well appointed, with a balcony overlooking a narrow, car free street. Close to shops, cafes restaurants and supermarkets and within walking distance of many attractions. I love the apartment! Spacious, clean and value for money. Many nice cafes around the corner. Elevator is small, so you might need to take a few trips if you have large luggages. We simply love the apartment! Our last stop of Spain trip was Barcelona. We wanted to relax, enjoying the city, watching soccer match & doing some laundry as well! The apartment was just what we exactly need! Inside Barcelona Team are really helpful! They provided us a lot of information to plan our trip around the Barcelona before we even arrived! We tried a few restaurants /breakfast shop recommended by the Team, and the food was soooo delicious! To Downtown shopping area : Both tram or metro are accessible from this apartment, but tram is faster. To Camp Nou : we chose to walk ( 20~ 30 min), because we enjoyed seeing the daily lives of people in Barcelona. It's really very near sants station and Plaça de Sants metro. Food near the apartments are much cheaper and nicer than the ones in the populated parts of the city. The streets also cleaner. The neighbourhood is quiet but there are always people around so it seemed safe. There's a lovely tiny terrace to hang out in during cool afternoons and evenings. The place is relatively well equipped. However the service and facilities need improving. When the staff was notified that the dryer wasn't working, nothing was done so i had to blow dry clothes that didn't dry overnight throughout my week long stay. I had only packed a few pieces of clothing since there was a dryer listed on the property. Very disappointing. The amount of body soap given was also insufficient. Only one bottle was given at the start and none given during the midweek cleaning. Sometimes there're ants in the bedroom, and weird white bugs in the toilet. Would highly recommend that you don't put your luggage on the floor. I like it here because the employees are warm welcome to me and kind attitude. And also clean place. The location is near subway station. Like to have refills of little bottles of shampoo and shower gel. Practically insufficient for 2 persons staying 4 nights. Will come again and really suitable for self traveller who need to go to the supermarket nearby and cook yourself . With washer and dryer machine which supply you could wash clothes. Location is closed to the train station and place de Santa metro. All were good except the limited supply of hot water for shower. The 2nd person probably had to wait at least 30mins before going for his shower. As such it defeated the purpose of having the bathtub in the shower room and drain stopper had been removed from the bathtub. We were met at the apartment and given information on the apartment and local surrounds. We had a studio apartment with a full kitchen and ample room for 2 people. All the appliances were in good working order and it was really good to have a washer and drier. Couldn't have asked for a better location - close to metro/train/bus, tapas bars, shops and supermarket and not to touristy. Photos on line are true to what you get and we were happy with our choice of accommodation. 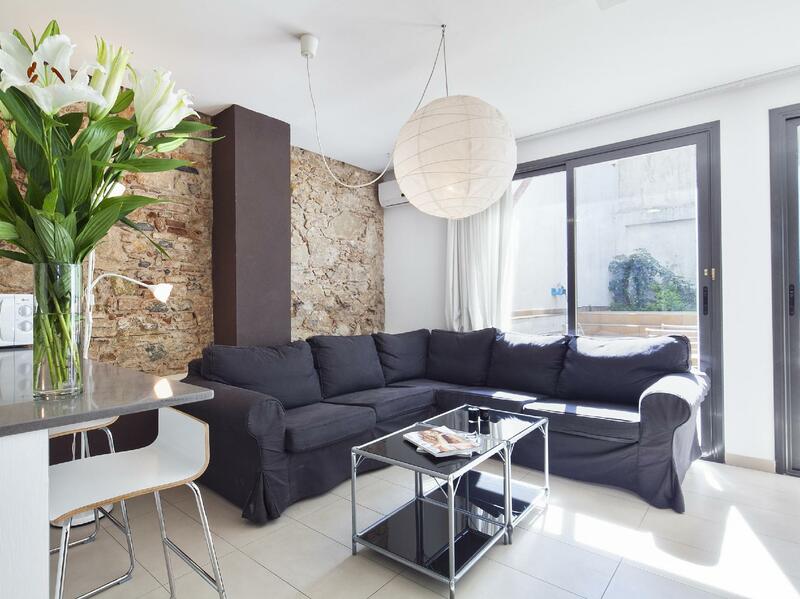 Walking distance to Sants Station and Metro. Good food around. Very comfortable. Only thing is no reception/front desk for emergency. It is very good location to all sightseeing point, easy access to the train and metro station. There are many restaurants around with good food. Good location & clean. But cannot leave luggage after check out because no staff there, have to store he luggage in lockers of sants station. However, my luggage size could not store in the even biggest sized locker....so we have to go airport earlier than expected. Inside Barcelona Apartment staff were great. Before our arrival, they emailed to ask if we needed any help with planning our itinerary around Barcelona. Really appreciate the staff's help to check us in on Christmas Day. Even though it was a public holiday, she was on time and very friendly. Upon checking in, we were given useful information on Barcelona and the area surrounding the apartment. Apartment was beyond our expectation. 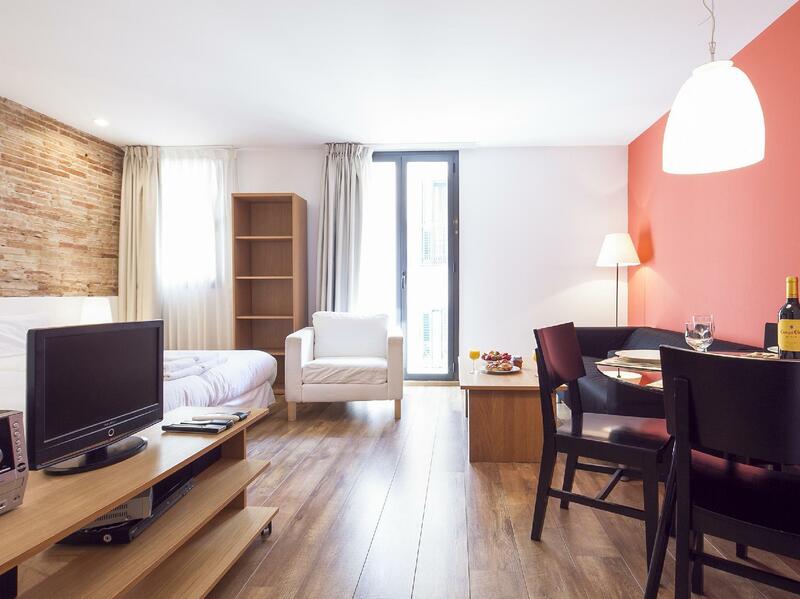 The location is centrally located at the Sants Train terminal which is about 5mins walk or less to the apartment. There are food and convenient stores at the same street of the apartment so if you need to get mineral water, snacks etc. they are opened till late. The apartment was very clean, well heated and has a TV with cable. It is not along the main street hence apartment was quiet and good enough for us to catch up on sleep. Overall, my friends and I have nothing to complain but lots of praises. We are happy to have stayed here and we highly recommend this to other travellers.